This report provides forecast and analysis of the global softgel capsules market. It provides estimated data for 2018, and forecast data up to 2026 in terms of revenue (US$ Mn). The report also includes macroeconomic indicators, along with an outlook on softgel capsules for the global market. It includes the drivers and restraints of the global softgel capsules market, and their impact on each region during the forecast period. The report also comprises the study of current issues with consumers and opportunities for softgel capsule products. It also includes supply chain analysis. In order to provide the users of this report with a comprehensive view of the market, we have included detailed competitiveness analysis and key players, and a strategy overview of the softgel capsules market. The dashboard provides detailed comparison of softgel capsule manufacturers on parameters such as total revenue, product offerings, and key strategies. The study encompasses softgel capsules market attractiveness analysis by product type, raw material, end user, application, and region. The report includes company profiles of the softgel capsules market, and the total revenue generated from companies across North America, Latin America, Europe, APAC, and MEA. By product type, the global softgel capsules market is segmented into gelatin softgel capsules and vegetarian softgel capsules. By raw material, the softgel capsules market is segmented into type-A gelatin (pork skin), type-B gelatin (animal bones & calf skin), fish bone gelatin, hydroxy propyl methyl cellulose (HPMC), starch material, and pullulan. Furthermore, by end user, the global softgel capsules market is segmented as pharmaceutical companies, nutraceutical companies, cosmeceutical companies, and contract manufacturing organizations. For the calculation of the market size, the portfolio and revenues of companies were tracked. This was followed by evaluating the market share for the companies in the global market in terms of both, value and volume. The prices of empty softgel capsules were tracked at the manufacturer level, and the volume of the capsules was evaluated. This report covers market dynamics related to softgel capsules that includes drivers and trends driving each segment and opportunities in softgel capsule market. Report also includes analysis and insights into the potential of the softgel capsules market in specific regions. Detailed profiles of the providers are also included in the scope of the report to evaluate their long-term and short-term strategies, product portfolio of softgel capsules manufacturers and recent developments in the Softgel capsules space. The report provides detailed competitive and company profiles of key participants operating in the global softgel capsules market. Some of the major companies operating in the global softgel capsules market are Aenova Group GmbH, Capsugel, Fuji Capsule Co., Ltd., Sirio Pharma Company Limited, Catalent, Inc., EuroCaps Ltd, Guangdong Yichao Biological Co., Ltd., Elnova Pharma, and Captek Softgel International Inc.
Softgel capsules have been derived using gelatin as the major raw material, since years. Investments by manufacturers in research and development activities and advancements in technology have led to the development and usage of other sources for producing softgel capsules which are vegetarian in nature, and also provide seamless manufacturing procedures for softgel capsules. The market of health-conscious consumers seeking natural, 'green' products is booming. More than 50 percent of consumers are willing to pay a premium price for a natural product, and nearly half say that they are willing to pay more for organic products, which is expected to drive the growth of the vegetarian softgel capsules (HPMC, starch, and pullulan softgel capsules) segment. Rising concerns and awareness among consumers towards healthcare spending have led to the demand for health supplements, globally, and prescribed medication in some countries. People are becoming aware about their body deficiencies, and opting for vitamin and nutritional supplements that are contained in an oral dosage format, which is easy to swallow and nutrients get well-absorbed in the body. Thus, the advent of softgel capsules plays a major role among infants and children as well as old people, as they face the risk of not being able to swallow the tablet properly. In terms of value, the global softgel capsules market is expected to represent an incremental opportunity of US$ 17.2 Mn by 2018 end over 2017. 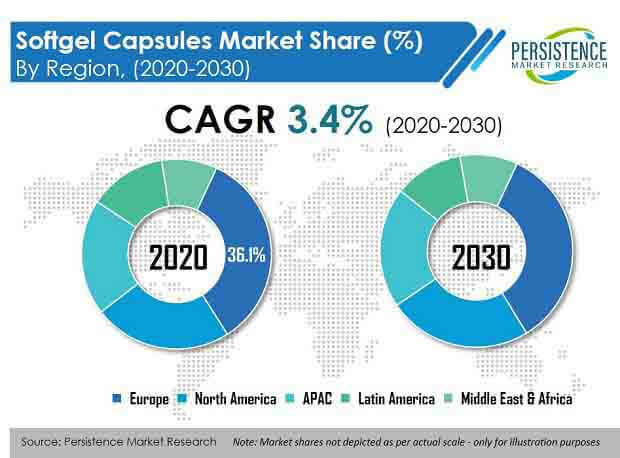 By end user segment, the cosmeceutical companies segment is expected to register a CAGR of 4.6% in the softgel capsules market. The pharmaceutical companies segment has a relatively high market share amongst the end user segments in the Softgel capsules market. The APAC region for softgel capsules is expected to gain 107 BPS during the forecast period. Sports nutrition is no longer only taken by professional athletes and weightlifters. Global events, marathons, gym-goers, and games events have all together thrown sports into the spotlight, and the rising interest in fitness and body image has made brands reposition themselves in providing products for a healthy lifestyle. The rising interest among consumers towards health consciousness is likely to outnumber and outweigh professional athletes. Thus, retailers are keeping more shelf space for sports nutrition products. This gives sport supplement manufacturers the opportunity to market sports nutrition products to a vast and varied consumer base in an oral dosage format – softgel capsules, globally. Empty softgel capsules manufacturers are undertaking various endeavors to provide unique empty softgel capsules which are more versatile and convenient for pharmaceutical, nutraceutical, and cosmeceutical industry applications. The preference of the pharmaceutical and nutraceutical industries is more likely to be inclined towards various empty softgel capsules because of their suitable properties for different formulations such as liquid and solid dosage forms, and easy-to-use features while administrating drugs orally or through inhalation routes. Various Softgel capsules products are entering into the market with advanced novel capsule features, such as chewcaps, hydrophilic sandwich (HS) capsules, duocaps, etc. These are significantly in demand among end users. The high cost of vegetarian softgel capsules and increasing dissatisfaction with quality standards are hindering the growth of the softgel capsules market globally. The trend to use novel technologies for filling liquids and semi-solids into softgel capsules in pharmaceutical, cosmeceutical, and nutraceutical companies is expected to drive revenue from the empty softgel capsules market over the forecast period. Companies manufacturing halal softgel capsules are obtaining halal certification from the Islamic Food and Nutrition Council of America (IFANCA), to capture a share in the markets in Muslim-dominated countries. Countries such as Malaysia and Indonesia are currently looking, both, to imported and domestic products that contain gelatin, but which have been produced using halal-certified ingredients. However, a few companies are maintaining their product portfolio with only hard and soft gelatin capsules. These companies can expect robust incremental growth opportunities if they expand their product portfolio with softgel capsules, vegetarian capsules, and other plant-sourced gelatin capsules. On the basis of region, the market in Europe is anticipated to dominate the global softgel capsules market in 2018. Europe and North America are expected to gain significant market share in revenue terms for softgel capsules market by 2026 end. Moreover, the softgel capsules market in Asian countries is projected to exhibit lucrative growth during the forecast period.